Fully guided small group nature adventure with world heritage national park camping and Lake McKenzie highlight! Travel with Sunrover on a fully guided adventure to Fraser Island! Travel with Sunrover on a fully guided adventure to the world heritage listed area of Fraser Island! Sunrover has been using the Dilli environmental campsite for the past 15 years and knows the heart of Fraser Island. This campsite is also the start of the Great Walks Trail on Fraser Island. With new green facilities, hot showers and a choice of 1 - 4 person tents only 100 metres from Fraser Island surf beach, this is one of the best campsites on Fraser Island! Be adventurous! Do what Aussies do, and camp! Alongside your travel mates, friends, family or other guests, you will take a fleet of 4WD vehicles around the island for a truly amazing 2 day adventure! 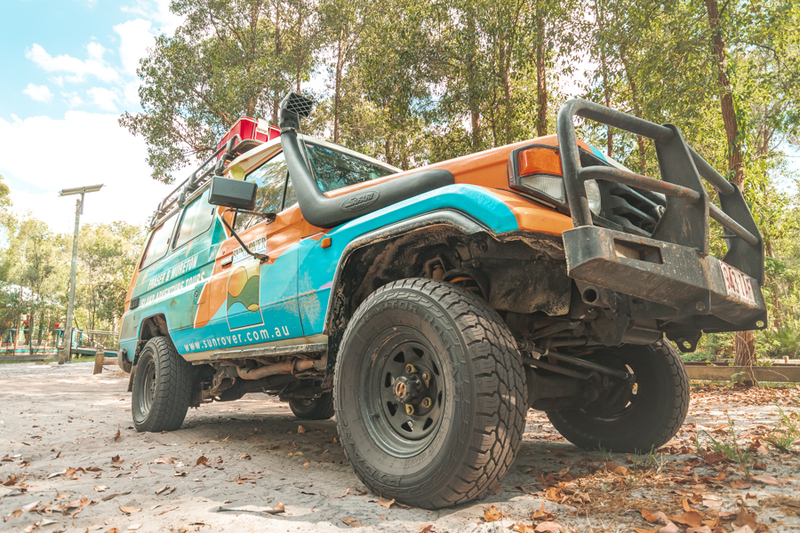 Guests can enjoy the views of Fraser Island as a passenger as your informative guide takes you from place to place! You can choose from a camping option or resort option with the tour. If you choose to camp, you will stay at the base camp at Fraser Island Research and Learning Centre (located in Dilli Village), Eastern Surf Beach. We will supply you with sleeping bags and a mattress and you will stay in one of our tents, choosing from 1 - 4 person tents to suit your group. Meals are provided and prepared fresh in our permanent camp kitchen with log timber seating, tables, fridge and gas cooking facilities. If you choose the resort option, you will stay at Eurong Beach resort and have access to all the facilities on site, such as shops, swimming pools, restaurants, laundry and more. You can choose from quad room, twin share or two bedroom apartment, each with a deck or patio as well as kitchenette, as ensuite bathrooms. Eli Creek - Fraser's most pristine creek and great place for relaxing! Lake Boomanjin - The red perched lake which is a great place to swim! Travel past the Glasshouse Mountains on the way to the Noosa River ferry and Cooloola Coast beach (tides permitting). After lunch catch the ferry across from Rainbow Beach to Fraser Island. Head to Lake Wabby, a barrage lake on Frasers East Coast. Afterwards relax at Eurong Beach Resort, before being driven to your campground at Dili Village. Enjoy your dinner & campfire at our Dilli Village facitlies. Day two - Breakfast - tea coffee, fruit juice, cereals and toast, jam, honey, fruits, breads. *Please note: Lunch on day 2 (not included in tour). This menu is a sample menu and is subject to amendments. $30 per person per day National Park & Permit fee. "Had a really fantastic time on the 2 day Fraser Island tour. Megan was the tour leader and her knowledge of the Island, it’s history and the wildlife, along with her easy-going made it a 5-star trip. Highly recommended! If you choose this trip, ask for Megan- she is the best!"